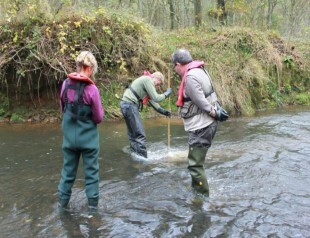 This week we’ve released our water quality archive as open data (you can find it all here on data.gov.uk). The archive provides data on the quality of rivers, lakes and estuaries. There are a staggering 58 million measurements and 4 million samples from 58 thousand sampling points from 2000 to 2015. Excitingly, the release of this data means we have now reached our #opendefra target to release 1500 datasets towards the 8000 set by Liz Truss in June 2015. We have released some really interesting data and seen it used in surprising ways. In September, we made LIDAR available for free. Archaeologists have used this data to find Roman roads; it’s been used to help the optimisation of rooftop solar cell installation; and gamers have used it to create realistic 3D worlds in the computer game Minecraft. In January we released information about flood defences and we have recently released additional flood data. Previously we had seen a number of innovative uses of our flood data, such as a free mobile app from The Red Cross which combines our flood warnings data and Met Office weather warnings to issue real-time alerts about severe weather. We found that we underestimated demand for some of our data: for example, the Energy Savings Opportunity Scheme (ESOS) is one of our most downloaded datasets (3885 downloads since its release in February 2016). It is a record of organisations that are compliant with the energy assessment and energy saving scheme, allowing UK companies to save £250 million a year through energy efficiency measures. Publishing so many datasets in such a short space of time has only been possible through the hard work and commitment of a dedicated team in the Evidence directorate. We have streamlined our processes and learnt a lot about how we can make publishing open data our business as usual. Along with releasing data about the environment, we have also released information about how we operate as an organisation, for example about the injuries our employees have had and information about our commercial vehicle fleet. We feel it’s important to release data such as this to increase the transparency of our organisation and we are looking forward to seeing unanticipated uses of this type of data. Releasing 1500 datasets in a few months is just the start and we have other exciting releases in the pipeline. We hold so much valuable data and we are already seeing the benefits of our open data for people, wildlife and business.